"An old man, swathed in a great cloak, the colour of which was not easy to tell. His face was long, with a high forehead, he had deep darkling eyes, hard to fathom." Paul Gregory is well known within the Heavy Metal music industry, for illustrating and designing Album covers and stage designs, however he is also a talented Tolkien artist, who’s use of light in his works is beautiful. Residence: Paul Gregory lives in Derby, England. Education and Career: Gregory became interested in art at an early age, encouraged by his art teachers he concentrated mainly on landscapes and nature. After reading Lord of the Rings, Paul began to be interested in making fantasy art. 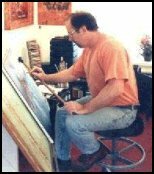 Paul began to sell his Tolkien work in the late 1970’s and become involved in the heavy metal industry in 1984, doing album covers for several bands including Saxon and Blind Guardian. Paul Gregory has also done the cover art for several fantasy fiction books and is now involved with the annual bloodstock heavy metal festival in the UK. He continues to do both Lord of the Rings and heavy metal album art. Tolkien artwork: Paul began his Tolkien work in the late 1970’s, with the canvas called Ride of the Rohirrim and has now been doing these paintings for over 20 years. He has exhibited in various places over the years, including a tour with Sotheby’s, displays at the Edinborough arts festival, the barbican at London and most recently the Leicester galleries. His works are not as well known as some Tolkien artists, but there has still been a great deal of interest in them. Kate Bush bought some of his canvases and his work has also appeared on television shows about the life and mythology of Tolkien. The future: Paul Gregory is still painting Tolkien, and we can expect at least two more paintings from him in the future, one based on The Two Towers and one based on the Return of the King. Gregory is also planning to do a book of his Tolkien inspired paintings.